​Our qualified European and Dutch patent attorneys focus on creating optimal patent protection for your innovations and capitalizing on your existing rights. Being one of DeltaPatent's founders, I helped to build DeltaPatents as patent firm delivering high quality patent services for the high-tech industry. Electronics and systems, data storage and communication, data encoding, cryptography, secure communication, cloud security, transmission protocols, in-vehicle networking, speech recognition, wireless radio, mobile audio, smart LED lighting, smart home & building. 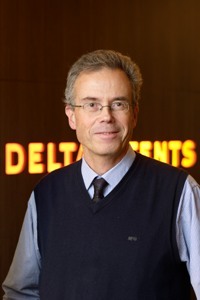 Prior to DeltaPatents, Karel worked in Philips as a system designer in military electronics for Philips Crypto, as a department head for Hardware Development, and as a patent attorney in Philips' intellectual property department.